How can you increase Twitter reach and engagement? That’s something that many marketers are thinking about, including Rand Fishkin, the founder of SparkToro, who has been wondering if Twitter gives tweets with a link less visibility than tweets without a link. And recently I’d been wondering the same. Then I heard about Aytekin Tank’s 17-million-impression tweet. So he continued to promote the Twitter thread. Eventually, it received 17 million impressions and the original Medium post (linked in the thread) got more than 35,000 visits. When I learned about this story, I started wondering how Twitter threads could help marketers. Could this be the new way to reach more people, drive more engagement, and get more referral traffic? Could Twitter threads be effective without ad promotion? We ran a small experiment to find out. What is a Twitter thread? Below is an example of a Twitter thread. If you click on the tweet, you’ll see the additional tweets connected to it. We spent $3,300,000 buying out our main VC investors. The objective of the experiment was to test if repurposing our blog posts into Twitter threads can 1. increase our Twitter reach and engagement, and 2. drive more traffic to our blog than tweets with a link. For each blog post, publish a Twitter thread and a simple link tweet (ideally at the same time, a few days apart). The next step was to draft out the threads and publish them. For this, I worked with our amazing social media manager, Bonnie Porter. I repurposed 10 blog posts into threads while she published them at our best times to tweet. So how did the experiment go? I think there’s an evidence that Twitter threads perform better than tweets with a link! For the Twitter threads, I looked at only the number of impressions and engagements of the first tweet and the number of link clicks of the tweets with the link (usually the last tweet of the thread). The actual total number of impressions and engagements of the threads (i.e. a summation of the impressions and engagement of each tweet in the thread) is much higher. But as the impressions and engagements are likely from the same followers, and to simplify our analysis, I considered only the impressions and engagements of the first tweet and the link clicks of the tweets with the link. The number of impressions was higher for all the first tweet of the Twitter threads than for the tweet with a link. 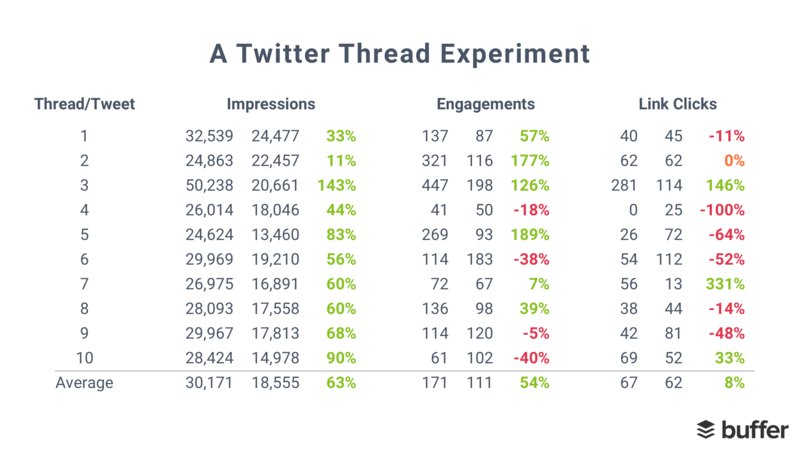 On average, the threads received 63 percent more impressions. Perhaps Rand Fishkin is right in that Twitter gives more prominence to tweets without a link. He found that “Tweets without URLs definitely correlate to more engagement+amplification (but this could be a result of user behavior, not intentional network design)”. The respective link was not included in the first tweet of the Twitter threads but mostly in the last tweet of the threads. 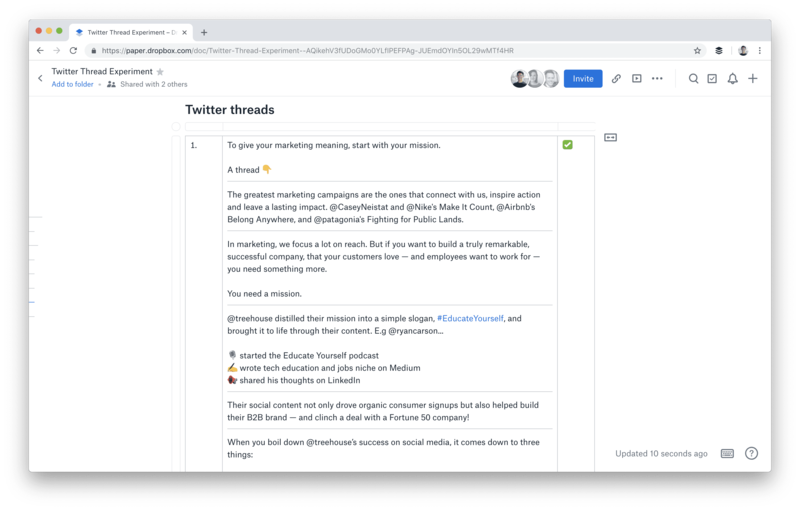 Threads could be a good way to increase your reach on Twitter while still sharing a link. The number of engagements was mostly higher for the first tweet of the Twitter threads than for the tweet with a link. On average, the threads received 54 percent more engagements. An interesting pattern I spotted is that engagement tends to be the highest for the first tweet of the threads and would decrease until the last tweet, where there would be a spike in engagement. My hunch is that most people only engage with the tweets when they first saw the thread (i.e. the first tweet) and when they finish reading the thread (i.e. the last tweet), and not when they are reading the thread. The higher number of engagement could have also caused the Twitter algorithm to surface the threads to more people, and hence, more impressions. This is where the experiment didn’t go as expected. Here’s my guess: For the Twitter threads, the link was attached to the last tweet or in the middle. Our followers don’t see the link immediately and have to scroll through the whole thread before seeing the link. This might have caused the lower link click number. But as Twitter threads seem to get more impressions than a link tweet, it might be possible that Twitter threads would get more link clicks. More data is needed to verify this. On average, the Twitter threads received more impressions, engagements, and clicks than the respective tweet with a link. While this is true based on our data, our sample size is tiny and the number of clicks fluctuated quite a bit. I wouldn’t say it’s conclusive that Twitter threads always perform better than tweets with a link in all aspect. But it seems fairly plausible that Twitter threads get more impressions and engagements. 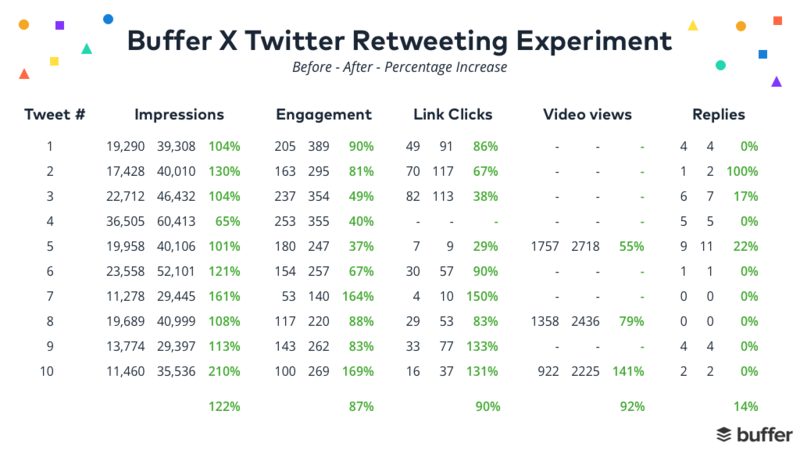 As it was challenging to run a large-scale version of this experiment (think thousands of blog posts) with just one brand account, we decided to test only 10 blog posts. As this is a tiny sample size, the results might not be replicable all the time (i.e. Twitter threads might not always perform better than link tweets). The sequence of the two tweets could influence the results. People might be less responsive to the link tweet if they have seen the Twitter thread. But the effect of this should be minimal as we have already shared those blog posts before. The day and time of the tweets could also influence the results. We tried to publish the Twitter thread and the respective link tweet at about the same time of the day to minimize the influence of this factor. Does this mean you should post only Twitter threads from now? Not quite. One of the key takeaways for me is the importance of experimenting with different or new content formats. While it’s the easiest to share a link, it might not always be the best way to get results. Twitter threads are one of the many things you could test. Others include images, videos, live videos, GIFs, and retweets. For example, we recently found that retweeting our top tweets is an easy way to extend the lifespan of the tweet and increase its performance. We found that it takes much more effort to publish Twitter threads than simple link tweets. You have to craft multiple tweets rather than just one. You have to manually tweet the threads while you can schedule link tweets. But I think that might be why Twitter threads seem to perform better. I believe that the content itself plays a big part in determining whether a tweet/thread does well. Crafting Twitter threads forces me to narrate a story over several tweets, and that might have encouraged me to write better tweets. On the other hand, I’m so used to sharing a link tweet that it’s easier for me to unintentionally craft a less-than-perfect tweet. From her experience, Bonnie found it helpful to have the Twitter threads plan out in advance in a document. It makes publishing threads less of a hassle when you have everything ready to go. Brian Peters, our Strategic Partnerships Marketer, once said how social media platforms should be viewed as the destination for your content rather than the means to get to your content. How does your audience want to consume your content? Do they prefer getting all the information they want through your social media posts, or do they want to click on a link and be directed to another page before they can find the information? It depends on the content but my hunch is most prefer the former. That might be why native content (e.g. Twitter threads, videos) tends to perform better than social media posts with links. People want the easiest way to consume content, and social media posts like Twitter threads and videos make it much easier than for them. They can get more information through the native content before deciding if the link will be relevant and valuable enough for them. Will you experiment with Twitter threads? If you will or if you have, share your best-performing Twitter thread in the comments section below. It’ll be great to learn from one another’s experience. Thanks!